543.1 At the opening of Tyrone County Fleadh Cheoil 2018 in Dungannon, this group of Tutors at Dungannon Comhaltas Branch play a selection of Reels ending with “The green mountain” and “The hare’s paw”. 543.2 At a session during Nenagh Castlefest 2018, a group of musicians which includes 5 flutes, play a selection of reels ending with “The Union reel”. They are Brian Hourigan (Nenagh) bouzouki, David Crowe (Clare) flute, Geraldine O’ Meara (Nenagh) flute, Sharon Kelly (Mullingar) flute, and her sister Leona McKenna on whistle, Ruth Morrissey (Nenagh) flute and Jim Lawlor (Nenagh & London) on flute. Recordded on 30th June 2018 in Hi B bar & restaurant, Nenagh. 543.3 Dundalk 12-15 Céilí Band play a Reel - “The rising sun” - in 12-15 Céilí Band competition at Fleadh Cheoil na hÉireann 2017 in Ennis, Co. Clare. 543.4 One of the many visitors to Nenagh Castlefest 2018 gets maximum return and enjoyment from his walking stick as he joins a street session of musicians from Ireland, England and USA for a Reel - “The golden keyboard” (M. Mulhaire). They are Michael McCabe (Dublin) flute, Ian Pearson (England) fiddle, Paul Dixon (England) piano accordion, Eithne Ní Dhonaile (Clare) harp, John Weir (Clare) fiddle and Seán Earnest (USA) guitar. 543.5 From Glasgow, Scotland, St. Roch’s A Céilí Band play a Jig - “The luckpenny” - in 15-18 Céilí Band competition at Fleadh Cheoil na hÉireann 2017 in Ennis, Co. Clare. 543.6 Macalla na hÉireann, Comhaltas Concert Tour of Ireland 2017, musicians and dancers with a selection of Reels, commencing with “Anna’s 40th” composed by Jody Moran, which won 1st place in Newly composed Tunes competition at Fleadh Cheoil na hÉireann. Recording was in Brú Ború, Cashel, Co. Tipperary on 20th October 2017. 543.7 The New York Céilí Band from CCÉ, Coleman-O’ Grady, USA, play a Hornpipe - “Bantry Bay” - in Senior Céilí Bands competition at Fleadh Cheoil na hÉireann 2017 in Ennis, Co. Clare. Band members are Erin Loughran, Maeve Flanagan and Jake James on fiddles; Mary Kate Carolan and Katie Shine on flutes; Séagda Coyle, accordion; John Redmond, concertina; Daniel Neely, banjo; Krista Charles, piano and Michael Fee on drums. 543.8 Dublin musicians Lucy Ní Fhaoiáin on harp and Maitiú Gaffney on flute play a Hornpipe - “The golden eagle” - at a session recorded in Cultúrlann na hÉireann in Monkstown, Dublin on 22/1/18. They are from CCÉ, Cr. Phiarais Uí Ghreagáin and CCÉ, Cr. Naithí, respectively. 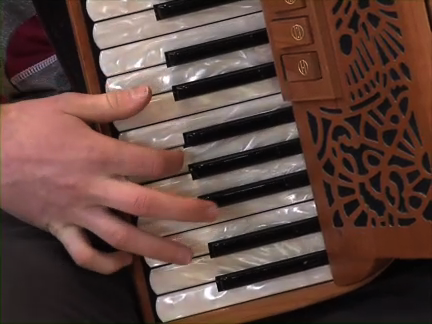 543.9 Fergal O’ Connor from Limerick who took 1st place in 12-15 piano accordion competition at Fleadh Cheoil na hÉireann 2017 in Ennis, Co. Clare, plays a Reel - “Dowd’s reel”. Recorded at a session in Freemount, Co. Cork, on 11/3/18. Fergal is a member of Freemount Pléaracha Group - All-Ireland champions 2018. 543.10 All-Ireland Champion 2017 on Concert flute and Whistle, Barry Conaty from NYAH Comhaltas branch in Cavan, plays a selection of Reels - “The new found-out” and “The road to Thurles” (P. O’ Brien). Recorded at a session in Cultúrlann na hÉireann in Monkstown, Dublin on 22/1/18. 543.11 Recorded at a session in Quinns’ Pub in Dungannon during the Tyrone county Fleadh Cheoil 2018, a selection of Reels starting with “The Longford collector” played by a group of approx. a dozen musicians from several different counties. They are - Peter Grew, fiddle; Ciarán Hanna, Concertina; Michael Heron, fiddle; Adam Prunty, flute; Damien Walls, banjo; John Linden, whistle; Shane McTaggart, drum; Kevin Crilly, accordion; Tony Graham, drum; Séamus Robinson, banjo; Frankie Rafferty, guitar, and Fergal French, pipes. 543.12 At the opening Concert of Nenagh Castlefest 2018, All-Ireland champion local musicians Colm Slattery on accordion and Jack MacPartaláin on uileann pipes play a selection of Jigs - “The maid on the green” and “The lark in the morning”. Keyboard accompaniment is by Kevin Brehony from Sligo. 543.13 With a ‘ traditional entry ‘ and attracting enthusiasts from outside on the street ( ! ) this session in Clarke’s Pub in Drogheda, Co. Louth on 17th July 2018 sets the atmosphere for Fleadh Cheoil na hEireann in August 2018, with musicians Gráinne Casey on guitar, Ciara and Orla Brannigan on whistle and flute (all from Drogheda), Catriona McArdle on concertina (from Glasgow), Daithí Kearney and Adele Cummins on banjo and piano accordion (both from Ardee). The Reels are “Miss Monaghan’s” and “Come west along the road”. 543.14 Recorded at the North American Comhaltas Convention in Chicago in April 2018, Robyn Jedlica (concertina) and Lexia Kennedy (fiddle) from CCÉ, Murphy Roche, Chicago, play a selection of Reels at a session in the Hilton Hotel, enjoyed by many of the visitors from several countries including Canada, USA and Ireland. 543.15 After taking 1st place in U-12 Whistle competition at Tipperary Fleadh 2018 for the 3rd year in a row, Caitlín McGrath, CCÉ, Ballycommon, Nenagh, plays 2 Reels by Finbar O’ Dwyer. Recorded in the Half-Door, Nenagh on 5th June 2018.